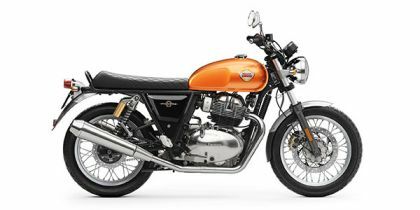 Royal Enfield Interceptor 650 price starts at Rs.2.51 lakh (Ex-Showroom, Delhi). At its heart is an all-new 648cc parallel twin, counterbalanced engine with air- and oil-cooling. Producing 47.6PS @ 7100rpm, and 52Nm @ 5200rpm, power is transferred to the rear wheel via a new 6-speed transmission with assist and slipper clutch. Though the engine is reasonably modern, the motorcycle has run-of-the-mill underpinnings: telescopic forks up front and twin shock absorbers at the rear. A large 320mm front disc and a 240mm rear disc with dual-channel ABS are offered as standard. Share your experiences with Interceptor 650? Q. Is there any option to fix kick road to start? No only self start. The engine design & Engineering cannot be tampered by us. Not at all and please dont even try to do so. Q. Is the front suspension/struts bouncy in nature? Q. Is it comfortable for daily office commute of 60kms total distance? I know it would be great highway cruiser, but what about city drive ability in traffic? No, it can't be done. Please check for TOURING DUAL SEAT or SINGLE SEAT RIDER . Performance is no way connected with seat. Q. How about exhaust heating of Interceptor 650, considering the position very close to pillion rider? Yes, the pillion rider might feel some heat from the silencer. However, the best way to clear all your doubts is by taking a test ride of it. Yes we have to be very careful. Q. Which is good to buy, Dominor 2019 or Interceptor 650, my height is 5.5 feet and my 90% riding will be in city traffic? Both are entirely different & Best among its class. Pl test drive both & go ahead . Confused about Royal Enfield Interceptor 650?